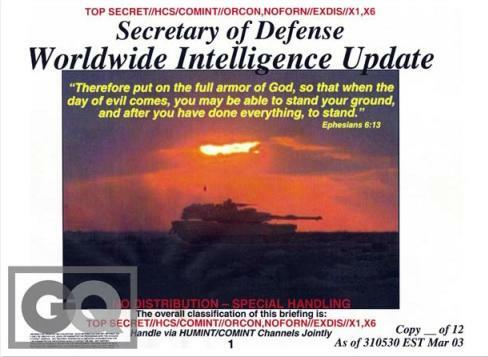 Via Daylight Atheism and corroborated by the BBC, I just wanted to share the news that high level briefings circulated in George W. Bush’s administration during the beginning of the Iraq war were emblazoned with Bible quotations. I won’t even bother with the rest of the spiel, because we all know the litany of excuses. Religion isn’t meant to be mixed with politics, check. Christianity teaches peace and love, check. People need faith, check. Churches are pretty, check check check. And just look at all the good it inspires! But these people just don’t get it. The point is not whether faith inspires good or bad, or whether it makes you feel all nice and fluffy, the point is that faith itself is fundamentally broken. Yes, you can use faith to justify the most wonderful things in the world, but that’s because you can use faith to justify absolutely anything at all. Faith is simply belief that is impervious to evidence, and only evidence can anchor belief in the real world. And to use faith – even for good – is to perpetuate the myth that faith itself is an intrinsically good thing and worthy of respect. And then stuff like this happens. Here’s a fun game: George W. Bush believes that the invasion of Iraq was carried out with the blessing of God, humanity’s divine creator. Is he right or wrong? And if you too believe as an act of faith that God is humanity’s divine creator, and that he has active plans for humanity, what possible intellectual tools do you have to argue that George W. Bush is incorrect? He has access to the same sense of faith as you. He feels that God is with him as much as you do. He can quote scripture as easily as you can. (Hey, he probably even thinks that churches are really pretty, too.) So, go on, genuinely, try arguing without being able to resort to the much-sneered-at concept of ‘evidence’ and see where it gets you. Powerful! Nice work! Love this blog! Yeah, I actually thought this too But it seems that internal communication apparently doesn’t need to be well designed! Churches *are* pretty! And they would be all the prettier as museums. Oi, Self, why didn’t my blog appear in feed mix, foo’?